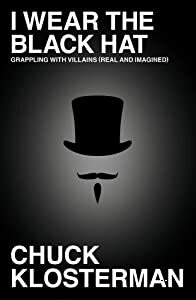 One of the books near the top of my "to be read" pile is Chuck Klosterman's new one, I Wear the Black Hat, which explores the modern understanding of villains (both real and imagined). For a chance at winning this book and a $100 Threadless gift certificate, leave a comment with which side you usually root for in a story, the hero or the villain. Though I occasionally find myself on the hero's side, I usually find the bad guys much more interesting. The winner will be chosen randomly at midnight ET Friday evening (July 19th).